Urethane dumbbells are hands-down the highest quality dumbbells you can get. Urethane is UV resistant, heat resistant, abrasion resistant, doesn’t smell like tires… Basically it doesn’t crack, peel, rub off, or degrade. The downside is because it doesn’t degrade it’s as bad as plastic as far as the environment is concerned. So you have to take the good and the bad. I haven’t been able to find much info on exactly how soon it can degrade. If they start making dumbbells in some material that doesn’t degrade at all for the first 50 years (basically it’ll last longer than you), and then starts decomposing nicely so we don’t have to feel guilty, I’ll let you know. Rubber does degrade, maybe a little quicker than you’d want it to. After a few years of heavy use you can notice the abrasion or effects of sunlight or heat. It may crack if the extremes are bad enough. Anyway, big time commercial gyms have gotten fond of urethane dumbbells in the last several years. The type of gyms who are cool with spending money to get stuff that looks and performs great for years. The big health clubs have an image to maintain and can afford to spend what it takes to keep their image intact. So rather than depend on managers to replace everything in a timely manner, they just buy great dumbbells to begin with. It’s actually a wise investment for a gym that plans on being around for a while. Depending on how you count it, urethane dumbbells cost about twice that of rubber, so once they have to buy a second set of rubber dumbbells, the urethane would have have paid for themselves, and a few years after that they’re actually cheaper long term. So it doesn’t take long for the investment to pay off. Here I’m comparing the best of the urethane dumbbells on the market today, so you can make sure you get the right ones at the best price. For some brands, the price of urethane dumbbells, unlike most other types of weights, is a higher $/lb for lower weights. The reason for this is urethane is expensive, and on the smaller weights the urethane itself makes up a larger percentage of the total weight, so the adjust the prices accordingly. So we are showing prices for the 50lb size as a sample. But some brands just price them all as the same $/lb and call it good. I purposely picked ones where the manufacturer gives an accuracy guarantee. That to me is a sign of quality. All of them here are decent. So if you think about it, 4% means a 100lb dumbbell can be off by up to 4 lbs. In reality, I don’t think that happens. I sell dumbbells and plates all the time with weight accuracy guarantees, and I don’t remember the last time I got a complaint that one was out of spec. If that happened very often the manufacturers would have to throw a lot away and jack up their costs. Iron Grip is the only one with 3 handle styles you can choose from. One of those options is fat handles, making it the only fat-handled urethane dumbbell on the market, that I know of. Straight handles are the most common. All these have nice thick handles, some of which are graduated thicker on the heavier sizes (hence the range given in the chart like 32-35mm). I like thick handled dumbbells like this. Even people with smaller hands really don’t mind them. Barbells are sometimes 28mm diameter, but that’s because they need to accommodate heavy pulling movements like deadlifts and cleans. With dumbbells your grip strength generally isn’t an issue unless you’re doing farmer’s walks, and in that case the whole point is to work your grip, so thicker is better. Some people like contoured handles, which are thicker in the middle and taper to the sides, and Troy VTX is the only option for that. It’s common with rubber dumbbells. And you know, for some reason every contoured handled dumbbell in existence has a weird knurl pattern. They don’t want to knurl the whole thing. I don’t know what the deal is. Round tends to be what commercial gyms have. Round is not always ideal for garage gyms, because garages have a 1 degree slope (mandated by law) down towards the entrance, and your dumbbells can roll. 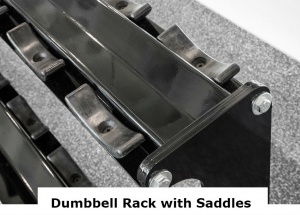 Round dumbbells also require larger saddle-style dumbbell racks (where each dumbbell is held by its own saddle), as they would roll around in traditional flat dumbbell racks. This is all typically no problem for commercial gyms, where a larger rack is actually helpful so that the dumbbells are spaced out enough so more users can get at the dumbbells they need and also replace the dumbbells into the correct spots. For lighter weights, 2.5lb increments is nice to have. When you think about it, most exercises involve two dumbbells, so you’re really jumping up by 10 lbs for every 5 lb increment. 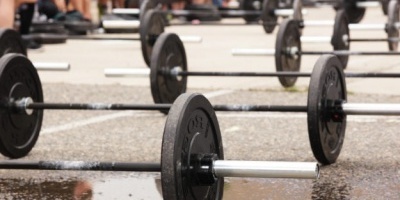 When you’re only lifting 20lb dumbbells, that’s a 25% increase in weight. Even lifters who regularly use the 50-100lb dumbbells may need the lighter ones for some awkward exercises like lateral raises or when rehabbing a injury, and in those cases the 2.5lb increments makes it easier to progress in weight. Unlike with iron dumbbells, with urethane ones you can’t stick magnets onto the heads to add a couple pounds to fill in the weight gaps. However, you can always use wrist weights (the type used for aerobics) and get the same effect. Troy VTX comes out as the lowest! I don’t have this listed in the chart, because only one dumbbell in this list is made in the USA, and that is Iron Grip. All others typically come from China. Troy VTX has the lowest price. They also happen to be the only contoured-handle dumbbell I’ve listed here. Personally I’ll use either type, straight or contoured. It just isn’t critical to me. I don’t have big hands, so the knurling stopping at a certain point on the contoured handle doesn’t matter to me. If you’ve used both types and don’t like contoured, or you have very wide hands, or if you’re concerned you might not like it, then go for a different model and save yourself the possible irritation. It’s worth paying a little more for something you know you’ll like instead of going on a gamble. So if you want straight handles, Rogue is your next choice. And Rogue makes great stuff. 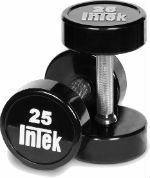 Their prices on other equipment isn’t necessarily the lowest, but they just happen to have competitive prices on urethane dumbbells. The bottom line is every dumbbell I’ve listed here is excellent or it wouldn’t be here. You can make an argument for picking any of them. 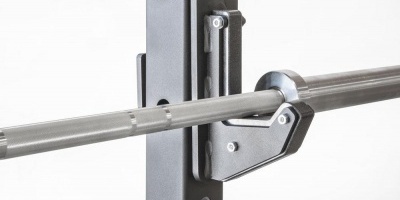 By the way, if you’re spending the money on urethane dumbbells, please don’t cheap out on your weight bench and ruin your experience using those nice dumbbells on a bench that doesn’t feel firm or sturdy. Trying to decide between GP pro dumbbells and iron grip ones. Which would you prefer or recommend? Where do you see the GP pro dumbbells? American Barbell had some by that name, but they were discontinued.